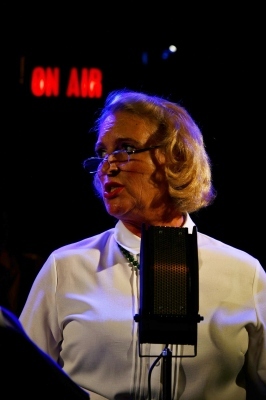 Catherine made her acting debut with Bawds in WAR OF THE WORLDS: THE PANIC BROADCAST (pictured above as Sylvia Holmes & Others). Recent appearances include MURDER IN THE CATHEDRAL (Matilda). Directing credits at university include WEST SIDE STORY. Appearances at the Pendley Shakespeare Festival include ROMEO AND JULIET, THE TAMING OF THE SHREW (Bianca), and KING LEAR (Cordelia). 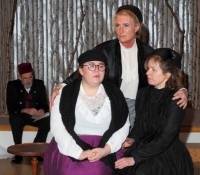 Productions for other companies include ALL FOR LOVE (The Prospect Theatre Company). Appearances for other companies in and around Cambridge include CYMBELINE, TWELFTH NIGHT (Viola), MUCH ADO ABOUT NOTHING (Hero), THE COARSE ACTING SHOW, THE SHOEMAKERS’S HOLIDAY, MISTER LEAR, MY THREE ANGELS (Marie Louise), HOME FROM HOME, OLIVER! (Mrs Bumble), BLITHE SPIRIT (Ruth), KEY FOR TWO (Harriet), TABLE MANNERS (Annie), THE STRONGER, THE GOOD DOCTOR, ARK ARK THE ARK (Noah's Youngest Daughter), CIDER WITH ROSIE (Rosie & Others), RELATIVELY SPEAKING (Ginny), THERE GOES THE BRIDE (Polly), WATERS OF THE MOON Helen), HOW THE OTHER HALF LOVES (Fiona), BITING THE BULLET (Dawn), SOAPSUD ISLAND (Various), CURTAIN UP! (Jackie), MEMORY OF WATER (Mary), DON’T DRESS FOR DINNER (Suzette), THREE SISTERS (Olga), ABIGAIL’S PARTY (Beverley), STEEL MAGNOLIAS (Truvy), PLAZA SUITE (Norma), 84 CHARING CROSS ROAD (Helene Hanff) and DANCING AT LUGHNASA (Kate). Appearances in musicals include THE SOUND OF MUSIC, SALAD DAYS, MY FAIR LADY, and ANNIE GET YOUR GUN. Catherine became an Associate of LAMDA in 1985.